For a small to medium-sized business, growth can be as much of a challenge as a revenue decline. And managing rapid growth was the problem, albeit a good problem, confronting Screenworks USA, a multi-million dollar screen printing, embroidery and dye sublimation business that supplies theme parks and other entertainment companies with customized apparel (t-shirts) and other wearables. 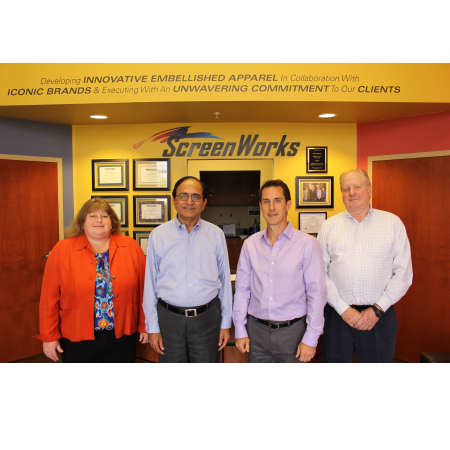 Co-owners Sharad Mehta, President and Brian DiZavala, Executive Vice President and COO wanted to be certain they were steering Screenworks and its growing business in the right direction. Based upon very positive past experiences Mehta had had with the Florida SBDC at UCF and its Advisory Board Council program, the company applied for and was approved for another Advisory Board Council. The Florida SBDC at UCF’s Advisory Board Council (ABC) is an economic development program that creates a no-cost professional advisory service for local companies. By acting as a matchmaker between businesses and volunteer advisors, all of whom are professionals in the community, the Advisory Board Council program acts to provide companies with business expertise that can directly address the company’s issues and that would otherwise be cost prohibitive and unavailable to a small to medium- sized business. And the contribution that Advisory Board Council assistance can make covers many sides of a business including operations, marketing, financial management, cost reduction, leadership development and succession planning, among others. Mehta and DiZavala worked with Advisory Board Council Program Manager Jill Kaufman, who hand-picked a team of board members to address the company’s needs and manage their growth. Experts in corporate finance, operations and marketing, comprised Screenworks’ board of advisors. The Board met with Mehta and DiZavala quarterly for review and counseling on a variety of issues, including operations and growth management strategies. According to Mehta and DiZavala, the assistance of their Advisory Board Council has paid handsome dividends for Screenworks. “Our success has come as a result of some of the efforts of our Advisory Board and has helped us not only quadruple our sales but also increase our employee base by about 100 and build our building,” remarked DiZavala.